"With the school summer holidays looming and two children to be entertained for the next six weeks, I was keen to see what new and exciting activities we could undertake without costing a fortune to fill those boredom moments. With one very active/inquisitive boy aged 9 and an arty daughter aged 8, a delivery of science adventures seemed the perfect solution. I chose the Letterbox Lab! The Investigate Box as it provided quite a few different activities for children aged 8+. My first impression of the box from the website was the packaging looked professional and knew it would appeal to my two children. I chose to pay £25 for the monthly subscription as this allowed me to trial the box before committing further, but if you paid for a longer subscription, it’s a little bit cheaper. Within a few days of ordering, we arrived home to find an interesting shaped box resting on my doormat waiting to be investigated. The children had been aware of its imminent arrival and couldn’t wait to open up the pack. The box was a thin, long shape, perfect for letterboxes with a fun design on the outside to excite and intrigue little minds. We were surprised six experiments could even fit inside, but once we opened it up, we realised how well packed it was with each activity separated into individual paper bags which were clearly labelled. This particular box was called 'Marvellous Mixtures', so the science theme was all about mixing various elements together, an instant hit with my slime-making daughter! Upon unboxing, my first impression was that this looks fun, and unsurprisingly the children couldn’t wait to get stuck into it. Once we were ready to start, they got the first paper bag out, and I picked up the instruction booklet. I looked through the booklet with the children first, so they understood what we needed to do for the first experience. It was all well written and designed in an engaging child-friendly layout as well as giving clear advice to supervising adults. It detailed all the information very clearly, what different experiments were in the box and what equipment was included this time around. EVERYTHING was included for this month's experiments, which was a nice surprise, even scissors and plenty of plastic gloves. We only had to add water with certain activities - it was straightforward to set up for them. The children were so excited to get going I had to monitor them, so they didn’t rush ahead and miss the instructions. The booklet takes the children through each stage and invites them to answer questions and even suggests additional activities for taking the experience further. I liked that each activity has a messy rating ranging from 1 star to 3 stars for most messy. The first experiment was fascinating and got the children engaged immediately. They followed the instructions precisely, completed the experiment and were amazed by the results. Removing the colour from a smartie was a great lesson and put them off eating it! My daughter aged eight was very keen on these tasks as she loves potions and mixing up concoctions, but she needed help reading some of the instructions from her brother. He was interested in the activities, but once his sister had got stuck in and taken ownership, he took a step back. After the first experiment, I felt confident about keeping my distance so my daughter could do some of the easier activities herself as it made her feel independent. The 'squirmy worms' and 'liquid rain down' experiments were the messiest and most fun this month! As far as I know, you can’t choose the theme of your boxes, you simply wait and discover new science every month, which isn’t a problem for us. The children receive a certificate and gift every 3rd box, and they move up the levels as you proceed through the boxes. There are 12 boxes in the series to last you all year. I liked that it was an activity that was practical, engaging and relevant to their age group and was fairly mess and stress-free. To further engage older children Letterbox Lab! could recommend them to upload their experiments to a YouTube channel to share with other budding scientists - making it more collaborative. As mentioned earlier, I opted for the monthly box at £25, which I think represents good value if you measure in terms of length of time to complete the box, as it was something we kept coming back to over a few weeks rather than smashing through them all at once. I feel this would be an excellent gift for any child over eight years. For the money spent, we have had plenty of fun together as a family, and my daughter has discovered and learnt more science wonders she can share back at school. I think my son would have preferred his own box so I might have to alternate who gets the box next time though! All in all, I really enjoyed the Investigate Box, it both teaches and surprises little minds every month, and it's one that I'll be recommending to my fellow parents. Sitting with the children and doing something fun at home isn't something we always get the time to do, so it created an interactive family occasion which I loved, and I am already looking forward to next month's box arriving." Discover the ultimate home lab for budding little scientists to conduct exciting experiments, learn and play. 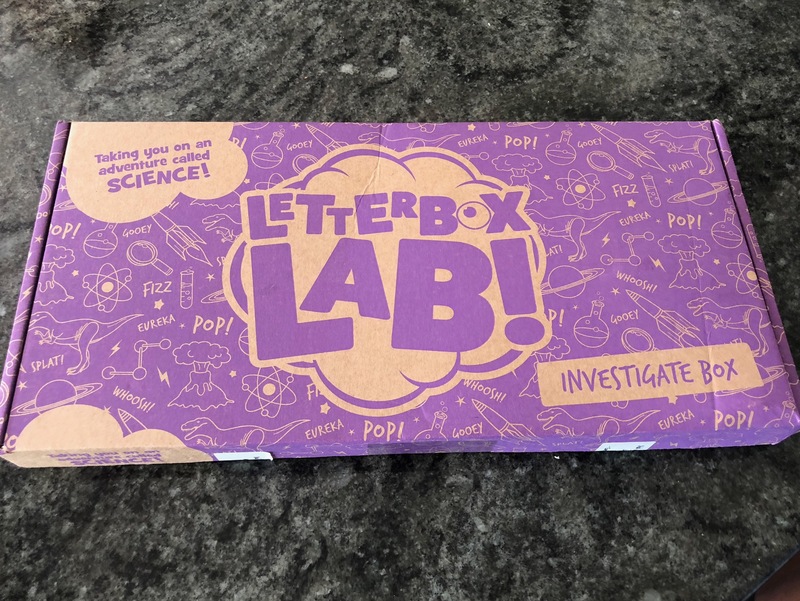 Celebrate science the fun way with The Investigate subscription box from Letterbox Lab. Make a scientific discovery today!